Part of the challenge in developing new therapies for ovarian cancer is the lack of an accurate animal model to aid in preclinical testing of candidate drugs. Some genetically engineered mouse models do exist; however, these mice have not been optimized for preclinical studies, leading to high failure rates during subsequent human trials. Researchers from the National Cancer Institute (NCI) and Frederick National Laboratory for Cancer Research reported in PLOS ONE that they engineered mouse models that develop ovarian cancer closely resembling the human disease. The models are easy to control for preclinical evaluation of potential therapeutics. Responses to both chemotherapy (standard of care) and a targeted drug in the mouse ovarian tumors were analogous to results observed in ovarian cancer patients. The research group started with genetically engineered mouse models that develop ovarian cancers, which the group had previously constructed. They adapted these mice to develop tumors faster and to produce cohorts of similar animals in populations large enough for routine preclinical studies. To test their responsiveness to cancer drugs, the scientists treated these mice with chemotherapies, including platinum drugs, known to be effective in humans. The mice responded to the treatments as humans would. Lead authors on the paper are Ludmila Szabova, Ph.D., Simone Difilippantonio, Ph.D., and Zoe Weaver Ohler, Ph.D., and authorship represents staff at the Center for Advanced Preclinical Research (CAPR), Center for Cancer Research, NCI. Terry Van Dyke, Ph.D., scientific director of CAPR, and a number of the laboratory’s colleagues contributed to the study, which was performed at the Frederick National Laboratory. Image: Allograft models were developed by transplanting tumor fragments into the ovaries of recipient mice. Tumor fragments were obtained from genetically engineered mouse (GEM) models that developed ovarian tumors after the induction of genetic alterations similar to those observed in human patients. These genetic events, within several months, lead to ovarian tumor development similar to what is seen in human serous epithelial ovarian cancer (SEOC). 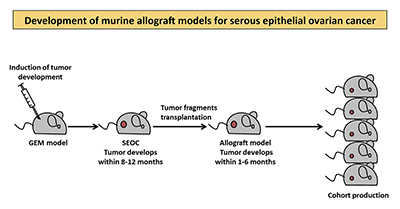 Using murine allograft models of SEOC results in faster tumor growth and allows for large cohort production, which represents a valuable tool for preclinical testing of therapeutic agents.